Freshwater mussels, also called naiads or unionids by scientists, consist of a soft body enclosed by a hard shell made up of two shell halves called valves. Inside the shell a thin tissue called the mantle completely surrounds the soft body. 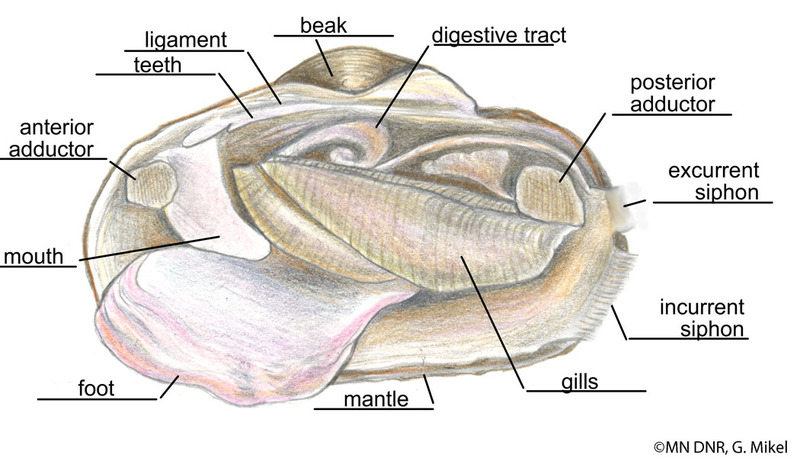 This mantle is also the part of the body that secretes the two valves of the shell. The valves, which are held together by an elastic-like hinge, have the ability to be closed by two strong adductor muscles whenever the animal senses a threat. Mussels are closely related to other bivalves (marine mussels and clams), as well as snails and even octopuses. Mussels living in our lakes and rivers filter oxygen and tiny plankton and nutrient particles from the water, cleansing the water in the process and absorbing what they consume into their bodies and shells. They do this by drawing water in through their incurrent siphon, moving the water over their gills, and then passing the water out through their excurrent siphon. Oxygen is absorbed through the gills, and food in the water, mostly particulate organic matter and phytoplankton, is carried to the mussel's mouth by tiny hair-like cilia located on their gills. Freshwater mussels inhabit lakes and rivers throughout the world, but they reach their greatest diversity in North America, where about 300 species are found. They often live in multi-species communities called mussel beds. These beds can support 30 or more species and are generally more diverse in rivers and streams than in lakes. Freshwater mussels have a complicated life history that is tightly linked to freshwater fishes. Males release sperm, (in illustration: 1, 2), into the water that are drawn in by the females. The fertilized eggs are brooded in the female's gills (in illustration: 3), where they develop into tiny larvae called glochidia . The glochidia are then released by the female mussels and attach to fish gills (in illustration: 4) or skin as temporary parasites. Over a few weeks to several months the glochidia develop, or metamorphose , into juvenile mussels while attached to the host fish. 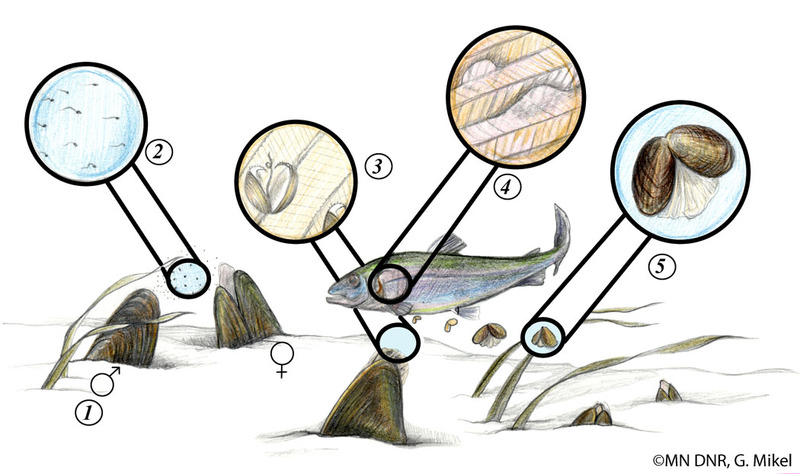 When this process is complete the juveniles detach from the host (in illustration: 5), fall to the lake or stream bed, and begin their lives as free living mussels. 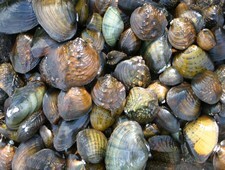 Some freshwater mussels require one particular species of fish as a host for their larvae whereas others may use many. One mussel species, the salamander mussel, is very specialized in that it only uses the gills of an amphibian, the mudpuppy, as its larval host. Attaching to a host is also the primary way that mussels are distributed throughout a water body; therefore, a mussel species' distribution is directly related to the host fish's distribution. Video of a plain pocketbook (Lampsilis cardium) mantle display. This slideshow requires the latest version of Adobe Flash Player. To improve the larvae's chances of contacting a suitable host, many mussel species have evolved elaborate methods to lure fish to the pregnant females. Females display and actively move their mantle lures to attract the host. When a fish strikes the lure, glochidia are released and attach to the fish. The plain pocketbook mussel has a modified mantle flap that mimics a minnow to attract predator fish like the largemouth bass (see video). Other mussel species package their developing glochidia into cases called "conglutinates." These conglutinates may resemble insects on which fish normally feed. When a fish attempts to eat this "imposter insect" the fish becomes infected with the mussel's glochidia. Primary predators of freshwater mussels are muskrats, otters, raccoon, geese, ducks, flatworms (on juvenile mussels), fish, and humans. 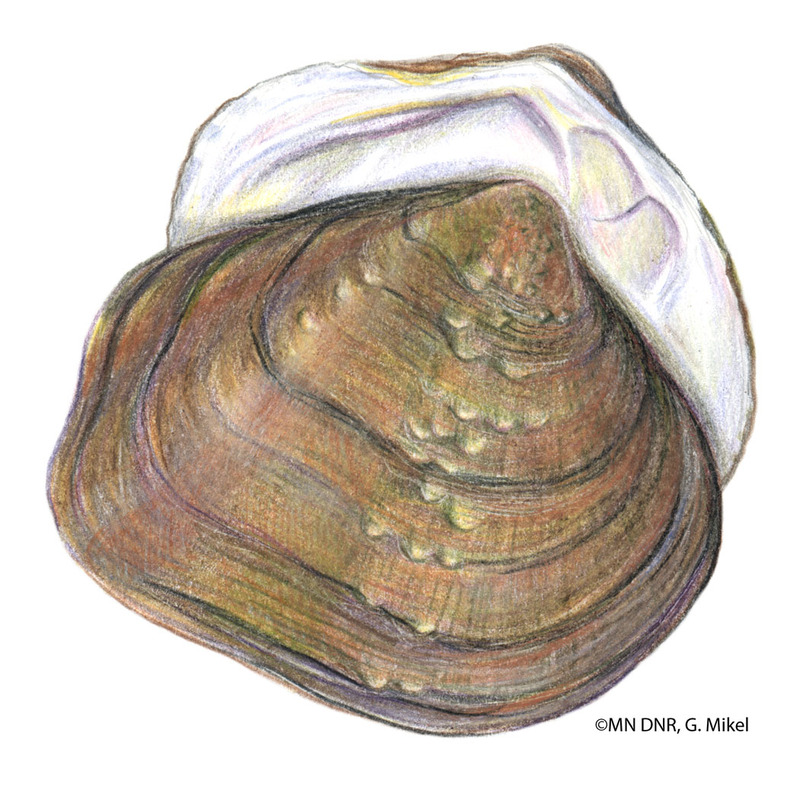 See Lesson 3:7 - Mussel Mania (25 pages | 2.6 MB) for more information and an activity on the impacts of Zebra Mussels on Freshwater Mussels in Minnesota. Mussels play a key role in aquatic environments. As filter feeders, mussels, often spending their entire life in a small area of the stream bed, are sensitive to changes in their environment and serve as indicators, or sentinels of the health of our lakes and streams. As sentinels of a river's health, Minnesota's native freshwater mussels provide us with an important measure of our society's impacts on rivers. Freshwater mussels are also considered to be "ecosystem engineers" because they modify aquatic habitat, making it more suitable for themselves and other organisms. The Minnesota Department of Natural Resources has initiated a statewide mussel survey project. The information gained about the distribution and abundance of our mussel resources will be used to protect remaining areas where mussels and the water resources that sustain them are healthy, and to target areas where conditions indicate that improvements are needed. No live mussels may be collected in Minnesota. If you pick up a live mussel, return it to the water immediately. Currently, with a fishing license, a person may possess up to 24 whole or 48 half shells of dead mussels. However, it is illegal to collect state listed species. Since many common species look like listed species, and even experts can sometimes confuse them, it is best to leave mussels where you find them. Minnesotans often mistakenly use the term clam when referring to a freshwater mussel. Have you ever heard of a fatmucket , purple wartyback, pink heelsplitter , black sandshell, or lilliput ? All are Minnesota mussels. Mussels are long-lived animals meaning they can live for several decades and in some instances a century or more. Freshwater mussels live on every continent except Antartica. North America has the most - nearly 300 species, including 48 in Minnesota.